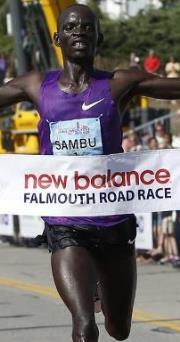 Stephen Sambu has won the prestigious Falmouth Road Race four consecutive years from 2014 to 2017 and is the first man to win the race four times. His major victories include the Cherry Blossom 10-Mile twice, B.A.A. 10k twice, New York City Half Marathon, Great Manchester Run 10k and the UAE Healthy Kidney 10K. Stephen ran a personal best 26:54.61 for 10,000m at the 2014 Prefontaine Classic in Oregon as a pace setter leading the field through a majority of the race and deciding to stay on the track after his pacing duties were complete. Sambu is a Nine-Time All-American for the University of Arizona and is the 2011 and 2012 Pac-12 10,000 meter champion. He was NCAA runner-up twice - in the 10,000 meters in 2012 and in cross country that same year. Previously, at Rend Lake Community College in Illinois he captured 10 individual NJCAA college national championships. His personal best times include: 3,000m (outdoors) - 7:51.74; 3,000m (indoors) - 7:51.59; 5,000m (outdoors) - 13:21.14; 5,000m (indoors) - 13:13.74; 5,000m (road) - 13:22,; 8k -22:02; 10,000m (track) - 26:54.61; 10,000m (road) - 27:25; 10 Miles - 45:29; 20k – 58:00: Half Marathon - 1:00:41 and Marathon - 2:11:07. The native Kenyan resides in Tucson, Arizona. GCR: You recently won the Falmouth Road Race for the fourth consecutive year. Bill Rodgers in the 1970s and Gilbert Okari a dozen or so years ago are three-time champions. What does the achievement of being the first four-time champion of this top-notch race that’s been around for 45 years say about your grit and tenacity and consistency? AA This year there was a lot of pressure and I was really nervous. The race organizers wanted me to do it and so I thought I would try it. To win Falmouth even once is really, really good – twice, three times, four times – it’s really amazing. It gives me that confidence when sometimes I don’t feel like I have the speed any more. It gives me more confidence to continue working hard. Since my goal was to win a fourth time this year I worked hard and it gave me strength toward the end. I was almost letting go, but there were people expecting me to do it and I pushed so hard. I put everything into my effort. GCR: During the race Luis Vargas took the lead pack through the first mile at 4:42, but then Abdi Abdirahman, Leonard Korir, Cam Levins and you formed a pack of four until slightly before mile four, when Korir and you broke away. Did you know that the next three miles it was going to be the two of you racing? And what were you thinking and how were you feeling? AA He’s always up there. My plan became to start pushing after three and a half miles because it had been comfortable until then. My plan from the beginning was to push for five minutes. We ran about a 4:27 for the fourth mile. I looked back and I didn’t see anyone else except Korir who was close to me. I knew his kick is very strong and his strategy and the way he always races is he won’t lead. He makes you lead the whole way until his kick in the last one hundred meters. I was thinking that I wasn’t going to allow the race to be like that and for him to outkick me. After 10k with only one kilometer to go Korir and I were pushing. I thought there was nothing I could do so it would be a kick for us. When we came toward the end I wouldn’t let him pass me. When we crossed the line after the finish I knew I had won. I looked to my side and didn’t see him, but he was very, very close. GCR: When you were racing down the final hill with thousands of people cheering you on, were you feeling so much energy from the crowd that it was helping you to go even better and faster than you thought you could? AA Yes, yes. There are families I have stayed with or met who know my name and other people cheering who know my name. When I hear them saying my name I go so hard and it gives me more energy to push. A lot of people were yelling my name and it was great. GCR: Let’s take a look back at your other three wins at Falmouth. The first time you won in 2014 you won by a lot as your 31:46 time was 45 seconds ahead of Micah Kogo. Did he stay with you for a while or did you pull away fairly early in that race? AA In 2014 Kogo was with me for about four miles but he was breathing hard. When I worked to pull away he just let me go – he didn’t try anything. It was a big win for me that year. GCR: The next year must have been really a battle as Kogo was back and he was joined by Leonard Korir and Sam Chelanga and the four of you finished within four seconds from your 32:17 winning time to 32:21. How crazy was that with the four of you all fighting to win? AA That was so tough. It was almost like this year, but his year ended up much closer even though there were only two of us. GCR: Leonard Korir has been up front with you the past three years, but last year you pulled away to beat him by a big gap as you 32:10 led him by twenty-five seconds. Were you just that much stronger or was he not quite as fit? AA In 2016 I don’t think Korir was in as good of shape. I always pay attention to the other runners. I can tell from their breathing and how they adjust when I try to pull away how they are feeling. This year it was nothing like last year because this year when I pushed for three minutes he was still there. This year was a very good year for him. GCR: You must like running in Massachusetts because you won the B.A.A. 10k in 2013 and 2014 and broke the 8k World Record along the way in 2014. Do you almost feel like Boston and the whole Massachusetts area is getting to be like a second hometown as well as you race and as popular as you are there? AA Always when I go there I feel like I am with friends. Even if I’m not in my best shape I still run very fast there. It’s very good for me and I’ve run a lot of good races in that state. GCR: You’ve also run some great 10ks in New York City as you won the UAE Healthy Kidney 10k in 2014 and then Ben True came along and edged you the following year. Do you like racing in New York City? AA Yes, I like running there. It is a beautiful city with a lot of spectators. That race is tough, but I enjoy it. Almost all of my top races are in New York City or Boston. GCR: Though you do so many fast and competitive 10ks on the road, it is interesting that at the 2014 Prefontaine Classic in Oregon you were hired to be a pace setter, but kept going and broke 27 minutes with your personal best time 26:54.61. Could you tell us about that race as it sounds kind of crazy that you weren’t even going to run, they got you to set the pace and then you ran so well? AA There was no plan as I was training for other races. They called me on a Wednesday to come and run as a pace setter on Friday. They first called Coach Lee and then my coach called me. They said, ‘please come and do this for us.’ I had just done some tempo running the day before, mile repeats. But my coach said it was okay. I travelled that night and stayed at a hotel in Phoenix. I took a really early flight in the morning on Thursday. There were three of us to set the pace – one guy through 3k, another guy through 5k and then me to the 8k mark. Then they said I could drop out. The time at 3k was good and then at 5k we were supposed to be at 13:25 and we did that. I don’t know what the 8k time was but I did what it was supposed to be. Then I only had 2k to go so it wasn’t smart for me to drop so I kept going. I was feeling tired but then I sprinted a bit when we were almost at 9k. Then after two hundred meters I kicked hard for two laps. I didn’t even know I was going to break twenty-seven minutes. At the finish line I saw 26:54 and I thought, ‘Oh wow, I’m glad I stayed in this race.’ I was so happy. It was really good. The people from Nike were so happy. They gave me a good bonus and they changed everything in my contract. They gave me a new contract to sign with an increase of money and some more bonuses. It was really good for me and changed a lot of things. It was a fast time and brought me more money. GCR: You had great success at 10ks and the slightly longer Falmouth 7-miler, but you stretched it out to the ten-mile distance at the Cherry Blossom 10-Mile Road Race. Could you tell us about the 2014 race when you won while Daniel Salel and you both ran the same time of 45:29? How did that race go and how do you end up in so many very close races? AA Daniel Salel was someone who was out there in the lead with me so we ran together and dropped everybody. Towards the end I started kicking with about 400 meters to go. I thought I dropped him, but I looked around and saw him coming. I increased a little bit and I won. He was trying to kick on by me. He pretended to have dropped and then came after me. He did that to me in New York one year when I was running with him and he said, ‘let’s go.’ I got away into the lead. The fans were screaming that someone was coming up on me, but I didn’t hear what they were saying. Then when I crossed the line I saw him on my left side and he just got me. GCR: The next year at Cherry Blossom he was back and Jacob Riley and Elisha Barno were also with the leaders, but you won by eight seconds. Did you pull away a little earlier in that race? AA I pulled away after eight miles. I pushed it and when I pushed it was me and Salel and Barno for a little while and then by mile nine I had pulled away. 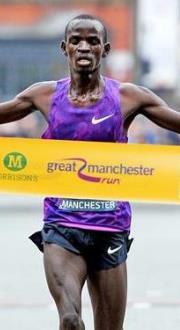 GCR: Most of your races are in the United States, but you did race strong at the Great Manchester Run in 2015 with a 27:30 time that was the fastest in the world that year. How was the reception in Manchester and was the weather a lot cooler racing there? AA It was very nice. The Manchester course isn’t flat flat, and it’s not hilly. There were many thousands of people running. We ran on one side of the road and then we ran back on the other side as they split the road. When we were coming back, people were running out and they were cheering for us. It was beautiful and a really nice town. GCR: You moved up to racing some half marathons. Was it much more difficult or did you just pace it a bit slower to feel comfortable, especially at your debut in New York City? AA In the beginning it was feeling very slow. After about 10k was when I started feeling it. The distance was tough at the beginning, but after some time when I increased my mileage it became easier. The half marathon is tough, but you can’t compare it to a 10k or 5k that are so fast. Depending on your training, the half marathon is a tough race. GCR: As many times as you beat Leonard Korir at Falmouth, in 2014 he out-leaned you in the New York Half Marathon. How strong was he that day? AA After that race in New York I knew that he had taken it from me, he was still my friend, but next time I would not allow something like that to happen. I knew that in the next race that, if I looked back, for sure he was not going to win. I knew that the next time I would have to be more careful about who was around me. That day I didn’t look back and I assumed I had dropped him, but he was there. The guy who finished in third place couldn’t believe that Korir had taken that race from me. GCR: Let’s talk a bit about your fastest half marathon, the B.A.A. Half Marathon where you ran 1:00:41. Was that a race where it all just came together and you felt great the whole way? AA That was my first time in that race. The first 9k was slightly downhill. At about 8k Lelisa took the leading and started pushing and pushing. Then Lelisa, Salel and I were together. With about 400 meters to go, when Lelisa took the lead, I knew that, even if I finished number two or number three, I was leading by fifteen seconds in the Boston three race series. I slowed down because I knew I had the series win and the check and then Salel came up and passed me. GCR: Wasn’t that the series where they added up each competitor’s total times from the 5k, 10k and half marathon and the winner was awarded $100,000? Were you able to take some of your winnings and use it to help people in your community back in Kenya? AA I helped them with a clean water system. I bought this machine with a clean water purification system. I knew I wanted to do something for them. I also bought some land and built some nice houses, so I did a lot of nice things with that money. GCR: After those close half marathon losses to Lelisa and Salel, you won the 2017 New York half Marathon over Wilson Chebet and Sam Chelanga. Was that a hard-fought victory? AA It was a good race for me and very rewarding. GCR: As fast as you have been at 10ks, 10-mile races and the half marathon, you stepped up last year to the marathon and ran a 2:13:35 at the 2016 Chicago Marathon. How different is it running the marathon and is this a distance you wish to focus on or do you feel your best racing is at the intermediate distances? AA When we ran the marathon I felt like we were running so slowly. At 5k my legs were dead. I tried to push it and didn’t feel good. Training for a marathon is also very tough. David Monti told me in New York that your first marathon is you against the distance – it’s you fighting the distance. He said that marathon number two is you against the time and then your third marathon is you against the other runners. He said you have to progress like that. You have to get used to the distance, then run for time and then try to run with everybody else. I was just trying to finish the 42 kilometers, next time I will try for a 2:10 or something like that, and the next time after that everything will be good. GCR: Since you’re talking about marathon racing, let’s chat a bit about your training. When you are normally training what is your weekly mileage and did you increase it and your long runs before the marathon? AA Before the marathon I did long runs, two or three 24 or 25 mile runs. I also did some runs of 21, 22 and 23 miles. I also increased my mileage to over one hundred miles a week. I think the training for a marathon is tougher than racing the marathon. You are so tired and you have to keep running all of the time. GCR: When you are training for 5k and 10k, what are some of your favorite stamina and speed training sessions and do you do them on the road or track? AA Mostly I do them on the road though sometimes I’ll do some repeat 1,000 meters on the track. There is one run where I will run one mile in 4:45 or 4:50, then the next mile in 5:50 or 6:00. We will run many miles like that. It is like running half marathon pace and then a moderate pace and I enjoy that. We will do ten to twelve total miles like that, so there are up to six fast miles. GCR: When you work on your speed do you do hill repeats or one minute intervals or other types of training for speed and power? AA I like to do longer fast pace running. I will run a mile in about 4:30 hard and then I will take a minute or 90 seconds rest jogging and do that eight times. I also do 400s on the track in 63 or 64 seconds. 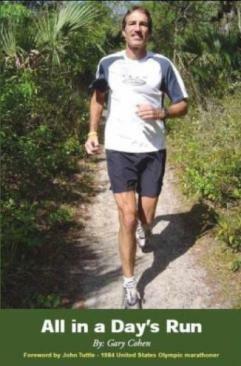 GCR: To keep it easy on your legs do you do much of your distance running on soft surfaces rather than paved roads? AA When I’m doing my mile repeats or tempo runs I do them on the roads. But when I do my long runs or my easy runs I always do them on soft surfaces and on soft ground. GCR: Does your coach have you do anything special to really focus on the mental part of training that helps you when you are really tired to push through to another level? AA My coach always tells me to finish strong. The last mile repeat is supposed to be my fastest one. He always is encouraging me during my workouts to push. GCR: I read that several years ago you used to train with Bernard Lagat. Do you do much training with others or is most of it on your own? AA Bernard Lagat is in Germany now. I do some training with Abdi Abdirahman. I ran with him when he was in Flagstaff. He is in Tucson now, but I think he is coming back to Flagstaff. When he is not around I do my running alone. GCR: Let’s look back at when you started running and how you came to the United States. When you were a young boy in Kenya how did you get started running and what were some of the highlights of your early running as you developed at a young age? AA I started running when I was in high school. At my high school if you weren’t in a sport you had to do cleaning. So every evening I would go for a run or play soccer. I also did some cleaning of the classes. I did that for three years. My fourth year I started training more for running. I went to the cross country trials and was number two in the District cross country so I thought I would run. When I graduated from school I went to a training camp. I ran a 5k time trial twice to win a scholarship. I ran 14:16. GCR: When you received the scholarship to Rend Lake Community College in Illinois, how was it when you came to the U.S. in terms of getting used to a new country, a new culture, the academics and athletics? Was it challenging? AA It was challenging. Everything was totally different. I had to learn things quickly. After a few months I adjusted. There were some other Kenyans and that was really good for me as they were able to help me and show me how to do laundry and how to cook. I wasn’t used to cooking on electric or gas stoves. GCR: Who was your coach and what was his influence on you in terms of your running progress and transitioning from a teenager to a responsible young man? AA Coach Stan McLain was my coach and he helped my ability. Everything was going smoothly and I had no troubles with the changes in training. I got a very good foundation and got my 5k down into the 13:50. GCR: You were a multiple NJCAA Champion while at Rend Lake Community College and captured 10 individual United States college national championships, including two National Junior College Athletic Association (NJCAA) national cross country titles. Was the success motivating you to move forward in an exciting way? AA After I won in cross country it made me want to continue to work hard. When you win one, people are expecting you to win again. That motivated me to work hard and to win again. GCR: Were there any races while you ran for Rend Lake that were close and competitive or were usually out front and winning easily? AA My first cross country national championship race was tough because it was a close race until the last 400 meters when I pulled away. GCR: After two years you went to the University of Arizona. How did you end up going there and running for Coach James Li? AA At the beginning I thought about going to Oregon and visited there. Then I went to visit at Arizona and Coach Li told me that after I finished college he would continue working with me. I thought that would be good for me and I really liked that. He was the only coach who told me he would continue helping me after I was done with school. Many of my friends ran for different schools and when they were done their coaches just forgot about them. Oregon had been my number one place to go to, but they didn’t tell me what they would do to help me after my school running was over. GCR: The competition was tougher when you went to Arizona and moved up to NCAA Division I as you were an All-American several times, but you weren’t winning titles. How good was it for you to race the stronger competition and to make you work even harder just to get to the podiums at the NCAA Division I level? AA It was tough. My first national cross country meet was hard as there were so many good athletes. But it was good as it made me work harder and harder all of the time. GCR: At the 2012 NCAA Men's Division I Cross Country Championships you finished in second place, just seven seconds behind Kennedy Kithuka. How much did you want to win and how tough was it to come up one place short? AA I really wanted to win one title in the NCAA at Division I. Sometimes it isn’t meant to be. I wasn’t meant to win in the NCAAs. You can’t force something to happen. I was number two in cross country, number two in the NCAA 10k and number three in the NCAA 10k. I was really close in the 5k. I was so close, but didn’t get the title. GCR: Was it nice when Lawi Lalang came to Arizona and you had a strong training partner? AA It was very good because he would out duel me. On long runs we would go faster because of me. On 400s he would go in 61 and that would help me to be faster. He helped me with speed and I helped him with endurance. It was good for both of us as we were good in different areas and helped each other. GCR: Going back to that runner-up finish at the NCAA X-C meet – five days later you went to the Silicon Valley 5k and broke the course record in 13:28. How neat was it running in your first professional race? AA It was good luck for me to start out that way and to start out fast. GCR: We chatted about your racing success on the track, roads and in cross country. Do you have a favorite type of racing? AA I like road racing. It is my favorite. The Eugene 10k is my favorite race. If I had to choose between the road and the track, I would choose the road. GCR: We’ve talked about some of your competitors who pushed you. It often takes a tough opponent to help us reach our potential. Did you have any favorite competitors or adversaries that really helped to push yourself to the limit? AA I like to race with someone who is willing to go in front to race with me and who doesn’t just wait for the finish line. Sam Chelanga and Ben True are not scared to get up front and to push the pace. GCR: You are still a relatively young man. What are your future competitive goals this year and over the next three to five years? AA I’ll be doing road races. I’m trying to break 60 minutes in the half marathon. I want to run 59 minutes or a bit faster. I may try it at the Houston Half Marathon in early 2018. I want to run under 2:10 in the marathon. My long term plan in the marathon is to run under 2:06. That’s my goal. GCR: What is the next marathon you will be running? GCR: Have you given any thought to whether you would like to keep competing as a Master’s runner or to be involved in the sport as a coach or in some other fashion once your competitive days have ended? AA Maybe I’ll start a charity to help with running in Kenya. In my town of Eldoret I could start a running race with prize money. I don’t want to run as a Master’s runner. I may do coaching. AA They don’t have to run a hundred miles a week. They should start slowly and get in a base. They should stretch before and after running. Also, small things can make a big difference. Even when someone gets to be a very good runner, 80 or 90 miles a week is a lot. GCR: What are the major lessons you have learned during your life from your youth in Kenya, the discipline of running, coming to a new country for education and athletics, and any challenges you have faced that you like to convey to groups to help them be their best in life? AA There are always challenges in life. The way to deal with challenges is to accept the challenges. I focus on what is coming. Without challenges you are nothing. You have to have challenges and deal with them. Be happy, talk to someone and find a good way to work with them.